New York City residents are experiencing a special kind of sunset this week, known as the "Manhattan Hold". During the phenomenon, which only happens a few times a year, the sun blends perfectly with the skyscrapers that stand on Manhattan's street grid, creating beautiful scenes for taking pictures. 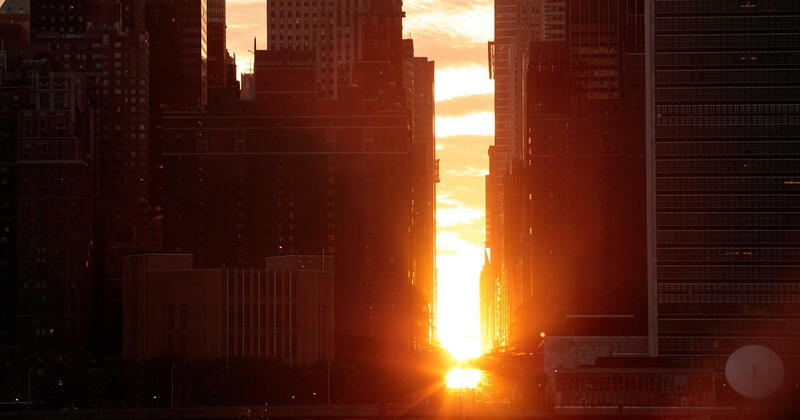 The name Manhattanhenge was christened by astrophysicist Neil deGrasse Tyson, who compared the positioning of the sun in Stonehenge during the summer solstice with the orientation of the sun over the city of Manhattan. The event unfolds on two evenings. "For those two days, when the sun is on the grid, half of the disk sits above and half below the horizon," Tyson explained. "But the day after that also offers Manhattanhenge moments, but at sunset you find instead the whole ball of the sun on the horizon." 3 pm. The second will be at 8:12 am on Wednesday, May 30th. According to the latest forecasts, both days should be good to see. Tyson recommends being in Manhattan as far east as possible for the best views. Clear cross streets include the 14th, 23rd, 34th, 42nd and 57th and several streets adjacent to it. "Beyond the grid you need a clear view to the horizon, like Manhattan across the Hudson River to New Jersey," he said. "And tall buildings lining the streets form a vertical channel to frame the setting sun, creating an impressive photographic opportunity." Manhattanhenge is a popular event for photographers because of the spectacular outlook opportunity to showcase New York City in various social media. Antonio Di Benedetto, product specialist at Leica camera brand, says "Location is the key" for the event and suggests getting up early before people approach the sunset time. "Finding a location is the biggest step," said Di Benedetto. "These crosswalks are special, get your typical wide-angle shot and try to combine them and make them unique." The ultimate goal is to dive into the glory of Manhattanhenge – which only happens a few nights a year. "Enjoy it for a fraction of a second," said Di Benedetto. "Cameras can sometimes distract us from the essence of the moment."